Artichokes are an easy and satisfying edible crop. 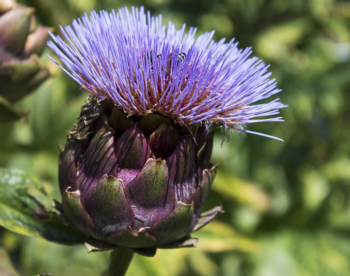 The bud, or immature flower, is the part of the artichoke that is harvested. The edible portions of the bud are the tender bases of the leaves (bracts), and the fleshy base upon which the flowers are borne (heart). The artichoke does best in frost-free areas having cool, foggy summers. Freezing temperatures kill the buds, and hot, dry conditions destroy their tenderness. The artichoke is a perennial, so prepare the soil well before planting. Mix manure, compost, or other organic matter into the first foot of soil in about equal volumes. Artichokes don't reproduce true from seed, so they're best planted by using root divisions available at nurseries. Or a healthy plant can be dug up, the root divided into two or more parts and replanted. 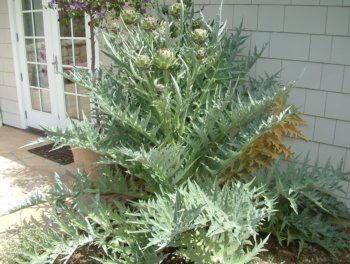 Artichoke plants reach a height of 3 or 4 feet and a spread of up to 6 feet in diameter, so allow plenty of space for them to grow. Irrigate thoroughly before planting. In areas where plants can produce all year around, feed them in the fall with a high nitrogen fertilizer. In cold areas, feed in the spring. Use a side dressing to fertilize. Apply approximately 1/10 pound of nitrogen per plant when the new crown growth begins. This equals 1 pound (2 cups) of a 10 percent nitrogen fertilizer, 1/2 pound (1 cup) of ammonium sulfate, an d 1/3 pound (2/3 cup) of ammonium nitrate. During the harvest season, apply 1/4 to 1/3 of the above amounts monthly. Artichokes require frequent irrigation during the growing season, and moisture deficiency results in loose buds of inferior quality. However artichokes won't tolerate standing in water, so plant the artichokes either on mounds or in rows with irrigation furrows. During the growing season, the artichoke needs to be irrigated about once weekly; irrigate more often in warm areas and less often in areas with heavy soil. Hoe to keep weeds under control. In the cool, coastal areas from San Francisco to Santa Barbara two crops per year can be expected. After spring harvest, cut off the old stalks just below ground. New shoots will develop and produce a fall crop. If you live outside the temperate coastal areas, there are several measures you can follow to insure the best crop possible. In areas with hot, dry summers, plant in partial shade. In cold-winter areas, temperatures near freezing will cause the outer skin of bud scales to rupture and give the bud a blistered whitish appearance. The blistered skin will turn brown, but this does not impair the eating quality of the artichokes. Sustained cold temperatures from 28 to 30 degrees F can completely kill the buds. which should not be harvested for eating. Temperatures below 28 degrees F may destroy all above-ground growth. If this is a danger in your area, cut back plant tops to 12 inches in fall. Tie these remaining stalks over the crowns and cover with mulch. Harvesting begins with the maturing of the first buds in fall and continues normally through the following spring unless interrupted by frost. Peak production occurs in spring. Cut artichokes from their stems about 1 to 1-1/2 inches below the bud base. Use immediately or refrigerate as soon as possible after harvesting. Buds allowed to become over mature will be loose, fibrous and inedible – but the blossoms are attractive as fresh or dried flowers.